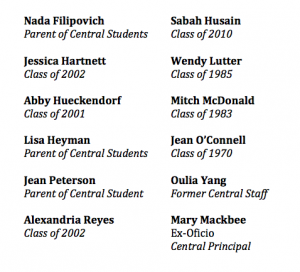 The Foundation Board is made up of Central Alumni and parents. The current officers and members are listed below. If you are passionate about Central and looking for a way to give back, please consider joining the board. For more information contact board@centralhighschoolfoundation.org or review the 2016 Annual Report – St. Paul Central High School Foundation. Subscribe to get periodic updates about current Central events, alumni and Foundation news. Get periodic news about Central, alumni, and the Foundation. © 2019 St. Paul Central High School Foundation.